Bariatric surgeon Dr. James Parrish chose to partner with Rosemont Media so he could create an informational website for people considering weight loss surgery. Dr. Parrish knows that the lifestyle changes individuals go through before, during, and after bariatric surgery can be difficult. He believes the key to success is through education and support, so he wanted a website that reflected these important values. Our design and development team worked to create an elegantly crafted and easy-to-use website that helps ensure visitors can find the information they are looking for quickly and easily. Through responsive website design, Dr. Parrish’s current and potential patients are able to access anything they need to know, no matter what type of device they are using to view the website. 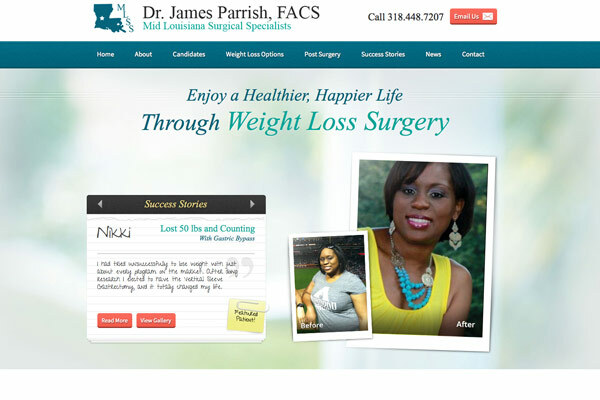 With the help of our writing team, Dr. Parrish was able to fill the website with helpful and thorough information about weight loss surgery options, including gastric bypass and the LAP-BAND® System. Patients are also able to utilize the website to find ways to stay healthy and gain support from others after surgery. The newly designed website also features medical SEO enhancements, helping Dr. Parrish gain visibility in search engine results and stay on top in a competitive market. To see an example of a customized bariatric surgery website from Rosemont Media and how it can benefit your practice, please visit alexandriabariatricsurgery.com.